Ticket Pricing - (2/7/19) When it comes to the price of admission, how much is too much? Surprisingly, despite what your initial take is, when you get down to it, this really is more of an individual choice question. 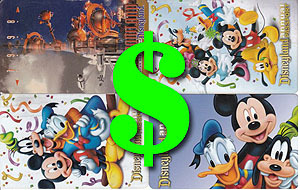 Doubly so when it comes to Disney fans and the price of admission into Disney theme parks which have steadily been on the rise each year for the past several decades. This week I decided to take a look at past price increase trends from Disney and even predict where the price is going between now and 2030, based on past increases, all in my latest article for BlooLoop. (1/7/19) You all knew it was coming sometime before Star Wars: Galaxy’s Edge opens this June, but over the weekend Disneyland raised their theme park ticket prices. The new price for a one-day, one-park ticket will range from $104 on a value day, $129 on a “regular” day, and $149 if you visit on a peak day… which will likely be every day after Star Wars opens for quite some time. I don’t know the numbers yet myself, but I’m also told that the various Annual Pass prices also jumped up anywhere from $30 for the lowest tier to a $250 jump for the top level Disneyland pass. Oh, and for you coast-to-coast frequent guests, those Premier Passes that are good at Disneyland and Walt Disney World jumped up from $1579 to $1949. General Resort News - (3/30/19) HUGE news from the Disney Theme Parks hit this week as they announced a complete ban on Smoking (and Vaping) inside all of their American theme parks starting on May 1st. The only place left to smoke from that point on will be in a designated area OUTSIDE the entrance of the various parks. Also on May 1st the park will begin restrictions on stroller sizes allowed into the parks, with a complete ban on the huge “stroller wagons”, and limiting the maximum size of regular strollers to be no more than 31” wide, and no more than 52” long. Loose ice and dry ice will also no longer be allowed in the parks, but sealed reusable ice packs are fine. If you have a need for loose ice in the parks, it can be obtained free at any of the various quick-service food locations inside the theme parks, along with complementary cups of ice water. (10/18/18) This doesn’t mean it will happen, but according to the OC Register Landrys, the parent company behind the Rainforest Café, has let it be known that they would like to reopen the former Anaheim Rainforest Café location at the Disneyland Resort if possible. Disney isn’t saying anything just yet, and even last week mentioned that while they were looking into a variety of options for the sites, they did specifically mention that they were not in talks with Rainforest about returning, as opposed to Earl of Sandwich which already reopened. Landrys does have a successful relationship with Disney however and had four eateries at Walt Disney World already: two Rainforest Cafes (Disney Springs and outside Disney’s Animal Kingdom park), the Yak & Yeti eatery inside Disney’s Animal Kingdom and the T-Rex Café, also at Disney Springs. So who knows… maybe if the idea of the Rainforest Café in California grew tired, they could perhaps work a deal to try a T-Rex Café instead. Or maybe Disney is just leaning in an entirely different direction right now… we’ll just have to wait and see. (10/17/18) First there is a rumor that The Rio casino in Las Vegas could possibly be sold and torn down to may way for a possible new MLB Baseball stadium… and now the Anaheim Angels just opted out of their lease for their home stadium in Anaheim where they have played since 1966. While Vegas was mentioned as a possible home for an expansion team, I’m sure they would be willing to move an existing team if they were given the option as well, though the Angels may prefer to stay in the local SoCal market and play in a new stadium maybe. But what does this mean for Anaheim? Interestingly enough, I had heard about three or four years ago a crazy tale, one that claimed the Angels and the stadium owner (which is actually the City of Anaheim) had just begun to get into a massive disagreement over their terms. This had led the Angels to enter into some early talks and discussions about the possibility of leaving their current home stadium. Now lets drop the big hammer here… and talk Disney. The Angels stadium sits on a huge piece of property, which Wikipedia claims is around 160 acres. The site isn’t that far from the Disneyland Resort and is already well connected to the local roads as well as public transportation system. That crazy tale I told you about? Apparently Disney was made aware of the issues between Anaheim and the Angels years ago and sort of let it be known at the time that they might be very VERY interested in obtaining the stadium property if it were ever to become available. Disney gaining the stadium site if the Angels no longer needed it would really be the only way that their California resort property could ever fit in a third theme park. So keep and eye on the fate of the Angels… it could have some major repercussions. (10/11/18) According to the OC Register, Disneyland has announced that they are “pulling the plug” on their plans to build that new luxury hotel on the west side of Downtown Disney. While a number of business locations there had already closed (Rainforest Cafe, ESPN Zone, AMC Theaters, Earl of Sandwich, etc…) to make way for the new hotel, Disney says that the site will remain focused on being used for shopping, dining and other entertainment needs rather than be used for a new hotel. No word on the others, but apparently the Earl of Sandwich location had already reopened at the start of October, much to the delight of the fans of the sandwich diner. While ESPN and Rainforest locations were removed, it is unlikely AMC would return to their former site as they have already set plans in motion to relocate to a new theater site across Harbor Blvd at the Anaheim GardenWalk. So what’s next for the Disneyland Resort then? With construction on a new parking structure going full swing between Downtown Disney and the existing structure, I’d have to think Disney may be rethinking about what to do with all the land they’ve purchased across Harbor Blvd instead right about now. That site was the one originally intended for the second parking structure along with a fancy pedestrian bridge to go over Harbor Blvd, so I have to wonder if Disney may be thinking of building perhaps a more medium or budget friend resort concept over there instead… something to break up the massive sprawl they’ve built on the other side of the resort where all the existing hotels and parking structures are located. Speaking of pedestrian traffic… the Disneyland Resort also confirmed that they will add a new pedestrian bridge that will run from the parking structures over Magic Way to the rest of the resort. This opens up things a bit more and provides a safe way to walk from Downtown Disney to the parking structures if you don’t want to wait for the parking tram. (9/13/18) Disney has confirmed that a new VR experience will be coming to The Void locations at Disneyland and Walt Disney World themed to our favorite video game character... Wreck It Ralph. Yep... you guessed it... "Ralph Breaks VR" is set to launch in Fall 2018 where you will break into the world of "the internet" with Ralph and Vanellope. If that wasn't enough, The Void also sent out their own tweet moments before confirming not only Wreck It Ralph, but another new VR experience themed around "an undisclosed Marvel movie" would be coming in 2019 as well. Assuming this new experience will tie into a new film release like Ralph Breaks VR does, I'm guessing it will be themed around either Captain Marvel, Avengers: Endgame or perhaps Spiderman: Far From Home. 2019 - New Parking Structures - Confirmed - (12/23/18) Construction is moving right along at Disneyland on the resorts second parking structure, and if all goes well and they can keep the pace going, it should be finished in time to deal with the extra crowds that will descend upon them when Star Wars: Galaxy’s Edge opens in the Summer. You can find some great pictures of the progress on the structure posted to DisneyGeek this week. (8/2/18) Progress is taking place to build the new parking structure at the Disneyland Resort and the latest pictures have been posted to Westcoaster this week. Scroll down more and you can get a peek at the backside rockwork going in for Star Wars: Galaxy's Edge and down some more to see what's going on in Downtown Disney and more. (4/7/18) Westcoaster is back with a new photo update from the Disneyland Resort where we take a long look at the progress being made to quickly build this new 6,500 vehicle parking structure in time for Star Wars: Galaxy's Edge to open next year. They also look around Downtown Disney and show off some of the major locations there that will soon be leaving to make way for the next resort hotel. The list includes ESPN Zone, the AMC Theater, Earl of Sandwich, Starbucks, Rainforest Cafe and a few others, though some may return in new locations, or within the new hotel when it opens. Keep on scrolling down for a look at what's going on inside Pixar Pier as well. (10/27/17) New changes are coming to the Disneyland Resort's future expansion plans. For starters, Disney has confirmed that, for now, the plans for the "Eastern Gateway" entrance and 6,800 spot parking structure are now canceled. Instead, a new plan is being put into action immediately that will see a 6,500 spot parking structure built on the location of the current Pinocchio surface lot right next to the existing massive Mickey & Friends structure. Construction on the new structure will begin in February 2018 and be complete sometime in 2019. The interesting thing here is that the various businesses along Harbor Blvd who were complaining about how the previous plans for a parking structure with pedestrian walkway over Harbor would hurt traffic flow to their locations will now find themselves in an even worse pickle. The Eastern Gateway project would have split up the guests arriving to the Disneyland Resort between the two parking structures on either side of the resort, and still allowed for guests to have a reason to be on the Harbor Blvd. side of the Disneyland Resort, either on foot, or driving as they arrive or depart the Eastern Gateway structure. Now we see Disney putting BOTH of the parking structures in the same basic location on the opposite side of the resort, which will essentially divert most of the vehicle traffic away from Harbor Blvd. entirely, and with the hotels and Downtown Disney all on the same side of the resort as the parking structures, Harbor Blvd. which once served as the "entrance" to Disneyland a long time ago, will now suddenly find themselves all sitting away from all the action, all alone in Mickey's backyard. At least until more of them start to go under and Disney quietly gobbles up the various parcels to add to what they already own, and then maybe they'll revisit the idea of an Eastern Gateway in another decade or two when they own the majority of it. Oh... and apparently a second parking structure is also planned to go up after this behind the Paradise Pier hotel that will provide dedicated parking for all on-site resort guests as well. prices are now “Seasonal Based” with Value, Regular and Peak Day Pricing. Read this for the full breakdown.